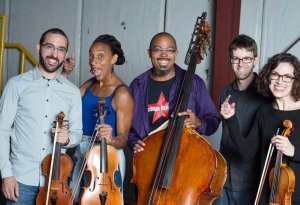 CutTime Simfonica (classical string quintet+drums) presents a lively, humorous and flirtatious Valentine's Day program, including classic symphonic plus adventurous new works blending Latin, tango, folk, rock, blues, country, soul and hip-hop elements. See what this group does with classical music off the pedestal, composed of musicians from Detroit's two major orchestras, the Detroit Symphony Orchestra and Detroit Opera Theater Orchestra. Expect works by Mozart and Bach swung to Mr. CutTime's (Rick Robinson’s) “Gitcha Groove On!” and a Beatles cover. The audience can join in at times on toy percussion. Look for live stream video on Gifts of Art Facebook.